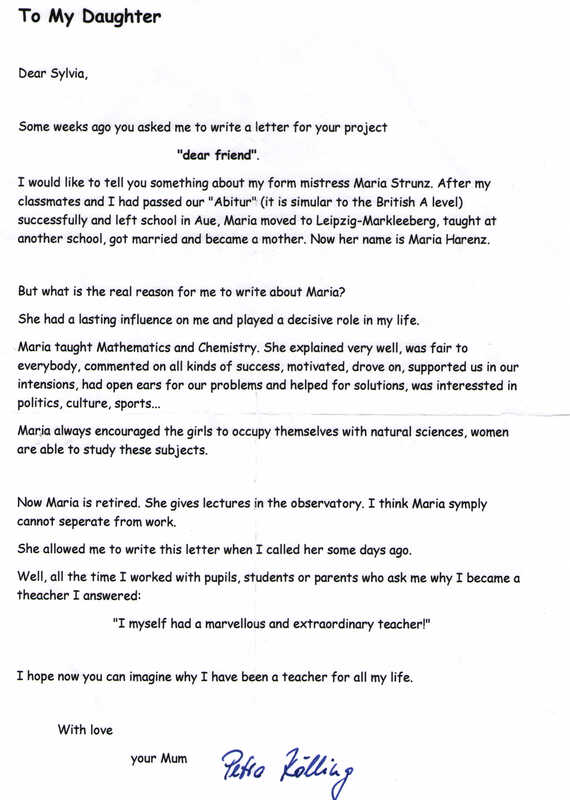 To Maria Strunz, teacher and lecturer. From Petra Kölling. Some weeks ago you asked me to write a letter for your project “dear friend”. I would like to tell you something about my form mistress Maria Strunz. After my classmates and I had passed our “Abitur” (it is similar to the British A Level) successfully and left school in Aue, Maria moved to Leipzig-Markleeberg, taught at another school, got married and became a mother. Now her name is Maria Harenz. But what is the real reason for me to write about Maria? She had a lasting influence on me and played a decisive role in my life. Maria always encouraged the girls to occupy themselves with natural sciences, women are able to study these subjects. Now Maria is retired. She gives lectures at the observatory. I think Maria simply cannot separate from work. She allowed me to write this letter when I called her some days ago. Well, all the time I worked with pupils, students or parents who ask me why I became a teacher I answered: “I myself had a marvellous and extraordinary teacher!”. I hope you can now imagine why I have been a teacher for all my life.